is the editorial director of Al Jazeera America online, and a former senior editor at TIME. He lives in New York City, where he also teaches at the New School. It’s been little noted that last November’s ISIS attack in Paris chose as its ground zero a football match at the Stade de France. For ISIS, there could be no symbolically richer target in France than the national football team, the prime manifestation of 21st-century Convivencia, the peaceful coexistence between Muslims and Christians that characterised the Iberian peninsula for 600 years, from the eighth century to the expulsion of the Jews and Muslims in 1492. ISIS literature calls for acts of violence to polarise Western societies, eliminating the space in which people of different religions, or of no religion, coexist in a common and equal civic identity. Since its construction for the purposes of hosting the 1998 soccer World Cup, the Stade de France has been the premier stage on which the French nation – and the enduring legacies of its colonial past – is performed, imagined and reimagined. Eleven men in the shirts of Les Bleus, with its Gallic Rooster crest, offer themselves – their lives and their matches – as ‘facts’ contested by French politics for competing narratives about who or what is French. Consider that in 1998, the National Front leader Jean-Marie Le Pen, the arch entrepreneur of xenophobic nationalism, dismissed the World Cup squad as ‘not a real French team’. That’s because its stars included Lilian Thuram, Thierry Henry, Christian Karembeu and Bernard Diomède, black players with roots in the French Caribbean. The team also included Ghana-born Marcel Desailly, Senegal-born Patrick Viera, and, of course, the great Zinedine Zidane, of Algerian descent. All these players were the legacy of French colonialism, and an expansive vision of French nationalism. The improbable success of the 1998 French World Cup team enthralled the French public. Thuram, a defender who rarely scored, produced two goals to win the semi-final. After retiring, he wrote two books, one of which is a study of the great Haitian revolutionary Toussaint Louverture, the founder of the second free republic in the Western Hemisphere after the United States. 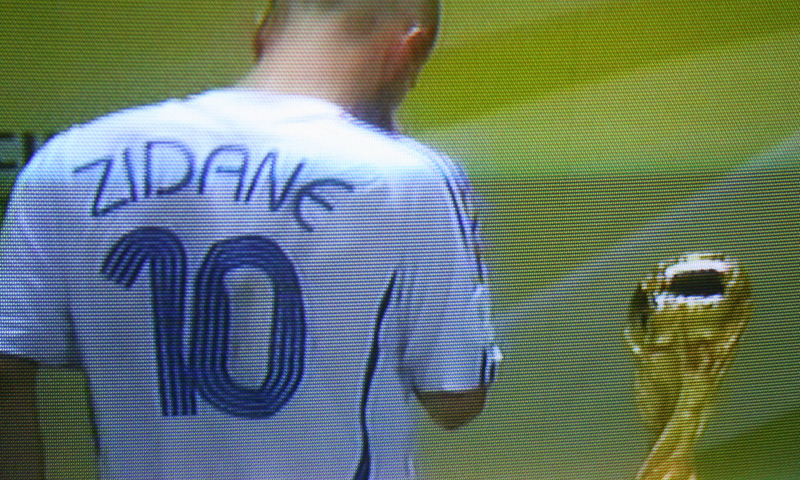 With two decisive headers, Zidane won the final for France. His image flashed on the Arc de Triomphe and crowds chanted for this son of an Algerian night watchman to be made president of France. ‘Black, blanc, beur’ – black, white, Arab – proclaimed the media and public. It was, of course, also a vision of the French nation, one in which the children of immigrants from France’s former colonies share a common civic destiny. The makeup of the team is of profound symbolic consequence. ‘The imagined community of millions seems more real as a team of 11 named people,’ wrote the British historian Eric Hobsbawm. ‘The individual, even the one who only cheers, becomes a symbol of his nation himself.’ Outside of state funerals and other traumatic moments, the only time most French adults in the country and around the world sing their national anthem is when they gather in front of the TV to watch Les Bleus. The triumphs of 1998, and at the European nations’ cup two years later, symbolised the potential for a capacious idea of Frenchness. Trouble has come since. The 2005 revolt of the banlieues shook the French public, reminding them that the optimistic symbolism of ‘black, blanc, beur’ masked still-harsh realities of life in the ghetto. Even earlier, in a 2001 match against Algeria, many young Parisians in the crowd had backed the visiting team – including carrying the Algerian flag on to the pitch to disrupt the game. Days later, Le Pen stood outside the Stade de France and announced a new presidential run. As Laurent Dubois has eloquently chronicled, the Stade de France was once again the site of a symbolic political contest over how to contend with France’s colonial past. The decline of French football that began with Zidane’s 2006 headbutt reached its nadir four years later, at the World Cup in South Africa, where a player revolt against the coaching staff precipitated an ignominious early exit. Gone was happy talk of ‘black, blanc, beur’. The French media and football establishment blamed the debacle on the black and Arab players (and also Franck Ribéry, a white convert to Islam). In the attending scrutiny, it emerged that the national team coach Laurent Blanc had questioned France’s reliance on black players, suggesting racial quotas and calling for preference to be given to players with ‘our culture, our history’. The very idea of the nation is premised on a shared history and culture. Can France include those who were often brutally colonised by a French Republic that proclaimed itself a bastion of liberty under the same symbols? Even in happier moments of success for an inclusive French football team, it was notable that many of the players – particularly those of Arab and African origin – declined to sing La Marseillaise, with its vows to irrigate France’s fields with ‘impure blood’. When the struggling team needed to beat Ukraine 3-0 at the Stade de France to qualify for the 2014 World Cup, most of the French media dismissed the prospects of the team, which by now was mostly black and Arab. The new National Front leader Marine Le Pen echoed her father’s themes of the previous decade by questioning the ‘French’ credentials of the team. This time it was Mamadou Sakho who played the Thuram role of defender who rarely scored by scoring twice in a make-or-break game. But it was the gesture that followed that spoke volumes. Amid their raucous celebrations on the pitch, Sakho and his teammates sang a passionate rendition of La Marseillaise, almost taunting Le Pen and other French nativists by dramatically performing their Frenchness, their right to embody the ‘national’ idea. Sakho is Muslim, of course, and his embrace of a multicultural French coexistence is anathema to ISIS. There were five Muslim players in the French squad the night that ISIS sent a suicide bomber to the Stade de France – and four in the German squad against whom they were playing. The Muslim midfielder Lassana Diarra, on the pitch for France that night, learned after the game that his cousin Asta Diakité was among the victims of the shooting rampage that began with the attempt to bomb the stadium. Targeting the tableau in the Stade de France was ISIS’s grotesque attempt to negate the French civic identity to which Sakho had proudly laid claim, as well as personified. ISIS and French nativists, including Le Pen and Charlie Hebdo, on the other hand, see no Muslims in their idea of France. The Stade de France has hosted many great football matches. But for two decades, it has also been the site of a greater contest, that of the idea of the French nation.